Whether it’s the guy on the cell phone who doesn’t look before stepping off a city sidewalk or kids chasing a ball into a suburban street, people regularly operate completely oblivious to traffic. Add into these scenes a distracted driver and the results could be tragic. Radar system: It scans both far ahead and to the side of the road to detect the presence of objects and measure the distance to them. High-resolution camera: It looks for objects that the radar system detects and identifies whether they’re people. Control Unit: It analyzes the patterns of people’s movement, determines if a collision with a pedestrian is imminent, checks for the driver’s reaction and directs the vehicle to react appropriately. 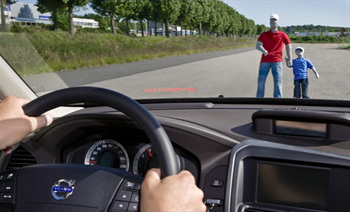 The driver receives a warning—both audible and visual, with a head-up display of red lights on the windshield—whenever the Pedestrian Safety system sees an accident waiting to happen. If he does not react, the system will automatically apply the car’s brakes, using 100 percent of the available braking power. It’s a last-minute attempt to avoid hitting the pedestrian, but one that will likely end well if the car is moving at a slow enough speed on dry and clean pavement. 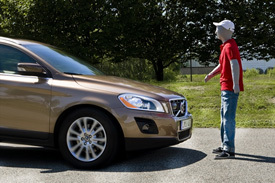 Volvo says Pedestrian Safety can prevent a collision at speeds between 2 mph and about 15 mph, but notes that stopping distance—and therefore the outcome—could be altered by road wetness or other adverse conditions. In addition, the company says, the camera optics are no better than human vision, so the system is just as likely as the driver to not see pedestrians in darkness, bad weather or indiscernible clothing. Volvo, of course, has been testing the system and I had a chance last week to drive an early version installed in a European 2010 XC60 “test mule vehicle.” I tested it on a dry segment of parking lot at Volvo’s Rockleigh, NJ, headquarters—a closed course that was occupied only by a dummy named Bob. Try after try, with approach speeds ranging up to 25 km/h (15.5 mph), Bob remained standing. To its credit, Pedestrian Safety did kick in and try to prevent the hit, but at speeds over 25 km/h, and with the system’s intentionally late reaction, the laws of physics made this impossible. Bob was leveled. And there lies the lesson: For pedestrians and drivers alike, not even a really smart car is a perfect substitute for staying alert.